Quick Access in Windows 10 File Explorer provides links to your most recently and most frequently used folders, which Windows chooses automatically, and when you open File Explorer, it defaults to Quick Access. 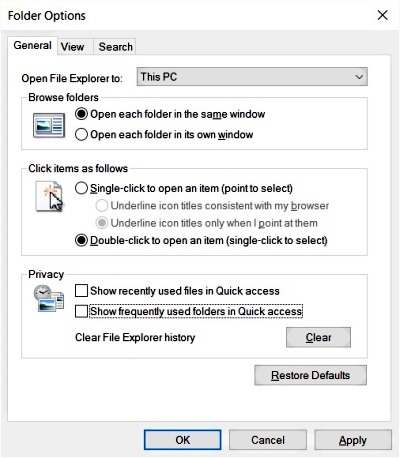 If, like me, you prefer to have File Explorer open to This PC or an actual Computer folder, then you can configure it to do so in the Folder Options dialog box. You could open the Folder Options dialog box by selecting the [View] tab in File Explorer's Ribbon, and clicking on Options at the right side of the Ribbon. But here I provide a way to access the Folder Options dialog box from an app on your desktop without even opening File Explorer. Right-click on a blank space on your desktop and, in the menu that appears, select New > Text Document. This will create a text document. Copy and paste the text shown below into that document, and save the file with the name folderoptions.hta. Now click on the .hta file, and in the window that appears, click on the [Folder Options] button. In the Folder Options dialog box that appears, on the General tab, from the drop-down menu next to Open File Explorer to: select This PC. In the Privacy section uncheck the box  Show frequently used folders in Quick access. Then click on the [Apply] and [OK] buttons. Then click on the [Close This Shell] button on the app.